San Diego pitcher Craig Stammen is on the mound for the Padres in this photo from an April 5, 2018 game against the Colorado Rockies at Petco Park in San Diego. Stammen, a Versailles High School graduate and North Star native, was in Cincinnati this past weekend as his team played a four-game series with the Cincinnati Reds. 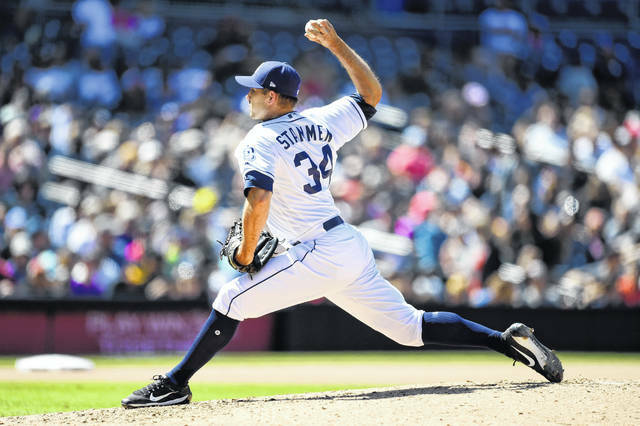 Editor’s note: This is the first of a two-part story on North Star native and Versailles High School graduate Craig Stammen, who is a Major League Baseball pitcher with the San Diego Padres. Part two will appear in Wednesday’s edition of The Daily Advocate. You can read the entire article on our website at www.DailyAdvocate.com. It feels great. It’s always nice to come back to familiar surroundings and a lot of people I know. It’s cool to come to a ballpark that I used to sit in as a fan and get to relive those memories.Seen a lot of family and a lot of friends already. A lot of young kids from my hometown that came down to watch the hometown Major Leaguer play and it’s kind of cool to take pictures with those kids and hopefully they get a chance to live out the dream I’ve been able to live out. You were able to pitch an inning on Thursday night here. How does it feel to pitch out there in this ball park? I’ll tell you what it is super fun for me. It’s like I get to live out the dream I dreamed of all the way coming up through Little League and high school of pitching in Cincinnati either for the Reds or against the Reds. Every time I get a chance to take the rubber here it is a special time. Was it always your dream growing up to be a professional baseball player? Yeah. I think it is every kid’s dream. My dream was I wanted to be a professional football, basketball, baseball, golf you name it I wanted to be them all you know and all at the same time. But baseball happened to be the sport I was best at and I have been able to keep it going and continue to play. The Reds were a big part of that rooting for them as a kid and watching the 1990 World Series and thinking that was the coolest thing ever. Watching all those great players from that team and trying to emulate them and be like them. It’s just neat to be kind of in the same realm as them. Who was your hero? Who did you look up to? My favorite player was Eric Davis. He and Barry Larkin were my two favorites that I followed throughout my years rooting for the Reds. How about any pitchers since that is your position? I love watching Jose Rijo and Tom Browning. The Nasty Boys too. I remember going out in my backyard trying to emulate Rob Dibble’s leg kick and I got Eric Davis’ swing down pat I think and just trying to field the ball like Barry Larkin. It seemed like it was normal back then. How have things gone for you in your nine years as a Major League player? It’s been longer than I probably ever dreamed it would last and it has been as special as I could ever think of. Started out in Washington then went through a little injury and came here to San Diego and started the process all over again. I was on a really god team and now we have a really young team here and trying to grow them into a perennial division winner and stuff like that so over my career I think I’ev gone full circle where I was the young guy and now I am the older guy trying to teach the young guys and it is just as satisfying as it was in the beginning. What did you learn as a young guy that you are now trying to teach the young guys? Just how to be a professional. How to show up every day and know that the work you put in eventually will pay off. You know Trevor Hoffman just had his Hall of Fame speech and we all got to watch it because we were in San Diego and he ended with there are no shortcuts on the true road to success and the rings true for any number us in here. If we put in the work we will eventually achieve true success whether that is in wins and losses or knowing that we did everything we could to reach our full potential and I think that is what we are trying ti instill in the young guys. Every day show up ready to go and try to reach your full potential so that sooner or later maybe San Diego can be in the World Series. Is there anyone in particular that mentored you when you were one of those young guys? Yeah, there were a lot of guys. Livan Hernadez, Jason Marquis come to mind. I had a really good coaching staff with the Nationals that I kind of came up with through the minor leagues and they were the big league staff when I was there. Also guys like Steve McCatty, Randy Knorr and Bobby Henley. Davey Johnson was a great manager, Jim Riggleman was one of the managers when I was really young and he kind of showed us how to be a big leaguer. There is so many people and I am leaving a bunch of them out, but every guy in here has his 40 or 50 people that showed him the way and I am no different than the rest. Is there still anyone from home that is that guy for you too? My favorite coach of all-time was my dad. He coached me in Little League. He never coached me past age 12, but I had a great high school coach in Tim Blakeley from Versailles High School. He was a great baseball man.He taught us how to show up at the ball park the right way wearing the uniform the right way, how to play hard and hustle and all that stuff. Went onto University of Dayton and had Coach Vitorio and Coach Linkliter and that allowed me to take that next step as a player to become a little bit better and be a pitcher and have the opportunity to get drafted. Then there were countless coaches throughout the minor leagues and big leagues that I have had. I try to keep in touch with them all. They have meant a lot to me. They should know the reason I am still here is because of them.